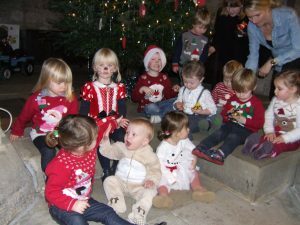 St Oswald’s Carers and Tots (age from birth to school age) meet on Tuesday afternoons during school term time in the Carlton Room in St Oswald’s Church. There are currently 16 carers and 21 children who attend on a regular basis. All carers are welcome whether they attend church or not. If you would like to join us for coffee and a chat with other parents and carers while your children listen to stories and sing songs, contact Christine on guiseley@yahoo.co.uk for more details. 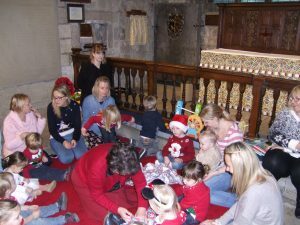 A lot of the mums come to the group after having their children baptised at Saint Oswald’s, and some now attend the 9.30 Sunday service and bring their children to Sunday School. We feel that this group helps to encourage this. 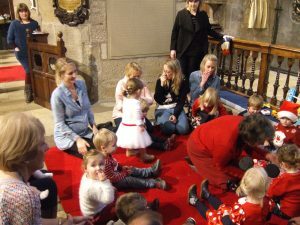 We have a Christmas party in Church with games suitable for the ages who attend and Santa leaves us a sack of presents hidden there for the children. Also in summer we hold an end of term party in the Carlton Room, with games for the older children. The carers pay £1.50 each meeting to cover the cost of coffee, fruit juice, biscuits, colouring materials, toys, jigsaws, books, etc. From this we also managed to save enough to buy Christmas presents for the children, and make a donation to the church general fund to help pay for heating and lighting.